The Dang Groundhog Saw His Stupid Shadow Today. I’m getting pretty sick of this whole “winter” thing. I’m tired of being cold and chilled to the bone. I’m tired of wearing a zillion layers. I’m ready for the sun. I’m ready for my fingers to actually be warm. I’m ready to wear as little as possible (but still be decent, of course). On Gobbler’s Knob on this fabulous Groundhog Day, February 2nd, 2008 Punxsutawney Phil, the Seer of Seers, Prognosticator of all Prognosticators, rose to the call of President Bill Cooper and greeted his handlers, Ben Hughes and John Griffiths. “As I look around me, a bright sky I see, and a shadow beside me. Did you know that groundhogs are rodents? Why are we listening to a rodent? 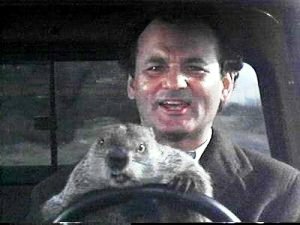 Groundhog Day, celebrated across the United States and Canada, on February 2, is purely a North American tradition. It is based on a belief that on this day (February 2) the groundhog, or woodchuck, comes out of hole after winter hibernation to look for its shadow. If the shadow is seen, it’s a sunny day. And the groundhog foretells ‘six more weeks of bad weather’ and thus a lingering winter. But spring is coming if no shadow is seen because of clouds. The groundhog then behaves accordingly. It goes back into the hole if the weather turns bad, but stays above ground if spring is near. next post: Staring At The Wall And Jim Breuer. 48 queries in 1.517 seconds.